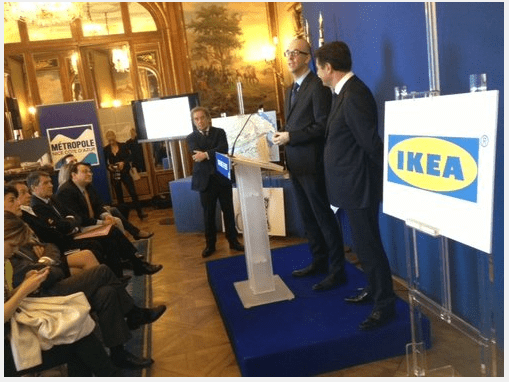 IKEA is now preparing to open on the Cote d’Azur. The world famous furniture store will open its doors in 2018, next to the Allianz Riviera stadium in Nice. The Swedish furniture empire announced the start of construction in early 2017. The French branch of IKEA is in charge of the new project, which was carefully designed to allow for harmonious integration into the heart of the new Eco-Area (Eco-Quartier). The IKEA will be a mixed-use space, surrounded by new residential complexes, office spaces and retail outlets. They have entrusted the new construction to the architect and designer of the nearby Allianz Stadium, Jean-Michel Willmott and Bouygues Immobilier as the subcontractor for the new “furniture heaven”. The news of the new IKEA store opening was not surprising. The Swedish company has seen even greater sales lately, bringing profits to a new high. According to the CEO of IKEA Group, Peter Agnefjall, sales this year increased by 7.1% and the overall sales volume of IKEA Group increased by 11.5%, reaching 32.7 billion Euros. Mr. Agnefjhall added that online sales are expected to increase by 40% in 2016. IKEA is not just a popular furniture brand, they claim it is a life philosophy. Early last summer the leaders of the Swedish multinational company organized free “Democratic Design Days”, where they invited more than 300 media representatives. Professionals of the design world, including Englishman Peter Dixon and Danish pair Rolf and Mette Hay talked to the guests about sustainable development, enterprise growth, cost management and quality control. 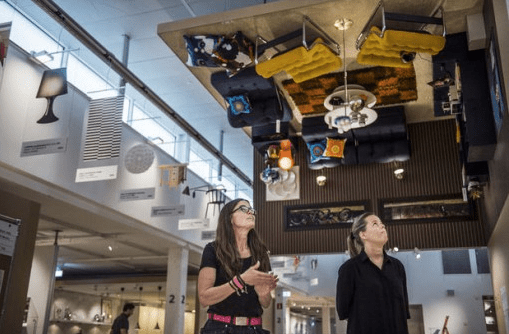 At the end of June 2016, the company held still another event: the Swedish town of Almhult, a “nerve centre” and the capital of IKEA, opened a museum honouring its incredible success. The museum building was built according to the prototype of the very first IKEA store. It has the same space, same number of floors and the original location of the working area. The Almhult unit of IKEA Sweden develops all the concepts and sketches of future models, issues the printed catalogue known round the world, and carries out various consumer demand studies. An annual “Life at Home” report focused its survey of large city residents like Berlin, Moscow, London, New York, Mumbai, Paris, Shanghai and Stockholm, on the definition of “what we call home.” It was to identify the needs of future customers and draw up a portrait of a modern society based on lifestyle and place of residence. 48% of respondents class “their home” as a place where they interact the most with other people. The study also revealed that, even if real human relations at home are important, they begin to lose ground in favour of virtual interaction and social networks. The experts also noted that family is no longer understood as a unit of society now that more and more people prefer to live separately. Social networks are taking a greater part in our everyday life and the concept of loneliness is changing. We can be physically alone, but lead an active virtual life. This explains the results of a Shanghai study, where 49% of residents prefer to have a good Internet connection, rather than more living space. New technologies also changed our perception of audiovisual media. TV used to gather all the family around it, now everyone spends time in his corner with a tablet or a Smartphone. This affects not only our social behaviour, but also furniture design. IKEA experts are interested in the objects that surround us at home. Interestingly, only 22% of respondents consider household items, including furniture, to be solely useful. The majority of others feel objects have more of an emotional value. There were also some questions about the impact of living near the “Swedish giant”. The new store’s management hope the answers will aid in preparing a better integrated store. In the coming months, the “Life at Home” report will also be launched in Nice, mobilizing experts in the field of sociology, psychology, art, neuroscience and design.